The entire team at TechWyse would like to wish everyone a Happy 2010! With the New Year brings lots of exciting news. So without further adieu let’s get to it! 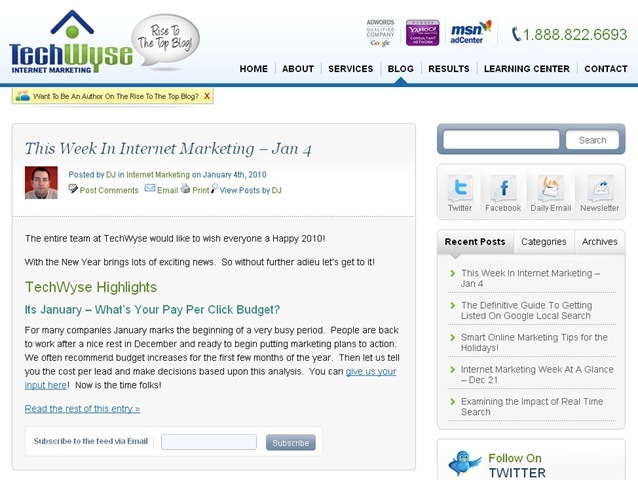 Its January – What’s Your Pay Per Click Budget? For many companies January marks the beginning of a very busy period. People are back to work after a nice rest in December and ready to begin putting marketing plans to action. We often recommend budget increases for the first few months of the year. Then let us tell you the cost per lead and make decisions based upon this analysis. You can give us your input here! Now is the time folks! 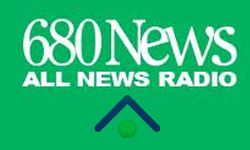 Many of our Toronto area internet marketing clients may notice some radio ads running on 680 NEWS in January! We are of course taking great lengths to measure the effectiveness of these radio ads. If you do hear them, we welcome your feedback! TechWyse is set to launch its new site design in January. For those interested we have already rolled out our new blog design. This went live last week and we are currently looking after any outstanding issues. What do you think? The last week has really provided us folks connected to the internet with some wonderful summaries of how 2009 went and what we can look forward to in 2010. Here are some of the articles that we liked best! Interested in understanding where the fragmentation of media is going in 2010? Here is a short 2 minute video found on the Google Adwords blog which helps you understand what we can expect in 2010. Google tells us which blogs got the most attention from there wealth of information. Some fantastic reads in there for people that want to get an idea about what people cared about in 2009. Popular blogs included talk about Google Chrome, Google Wave, Google Voice and many other items. No matter if you are a business owner, marketer or person working from home, we cannot think of anyone that wouldn’t benefit from this ‘HOW TO’ article. There are over 30 helpful links to learn how to do important things online. Whether you want to learn how to run a social media campaign, understand everything about Twitter or even how to use LinkedIn to build your personal brand this is a great read. Throughout much of the year we have heard much about Twitter. This article provides clear indicators of the phenomenal growth of Facebook during 2009. In 2009, Facebook surpassed MySpace in visitors with a count of 68.5 million visitors. In January 2009 Facebook already had 150 million users. Just one year later they have more than doubled this number and are now at 350 million accounts. Read this article to see what Facebook did right in 2009 and where they are going in 2010. Just for entertainment purposes we also thought we would point you to Yahoo’s 2009 Year in Review. This features many of the highlights from top 10 searches to financial outlooks. To keep informed about the internet marketing industry I urge you to flag our blog for daily email updates here and also visit our Rise To The Top blog regularly. Again – welcome back and hope to connect with you even more in 2010. In my opinion, 2010 will be the year of Facebook and Twitter. This is well worth a read to make us informed with latest information on the reeling trends about online media.